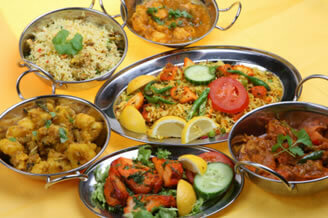 Find the best Indian takeaways anywhere in the UK. Read reviews from their customers, check out the menu, order Indian takeaway food online and get food delivered to you within minutes. biriani, pilau rice, lamb and vegetable curries. Here are some of our latest additions to the very long list of Indian takeaway restaurants that are available to order food for delivery online. For full and complete listings in your town or city please type in your location in the search box provided on this page. Order Indian takeaway online, tandoori, biryani, balti, masala, pasanda, curry, madras, vindaloo, korma, bhaji, pilau, naan, papadum, kebab, chicken tikka massala. All this just few clicks away.